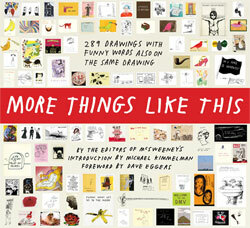 More Things Like This — Curated by the editors of McSweeney’s, this unconventional book explores the intersection of text, humor, and illustration in art created by cartoonists, writers, musicians, and fine artists. A refreshing mixture of high, low, and sideways, the selection features nearly 300 images from dozens of contributors, including David Shrigley, Kurt Vonnegut, Leonard Cohen, Chris Johnson, David Mamet, Raymond Pettibon, Henry Darger, and many more. Insightful interviews with the artists further illuminate the shared and divergent approaches they take in creating this smart, funny, and engaging work.